At the start of each year lots of people make New Years Resolutions, I am not really a big believer in the New Year New You philosophy. The main reason is that it gives the impression that there is something wrong with who you are already, you don’t need to be fixed and you are enough! We are all capable of achieving whatever we put our minds to. There is no need to change who we are we just need to know that we all have the ability to realise our dreams. All we need is the courage to take the steps towards whatever they may be. As a Coach it’s important to reflect on yourself, lead by example, how can you inspire others to do the same if you’re not doing it yourself? After Christmas last year (2018) I found myself thinking of how I could challenge myself, what could I do to help me learn what my full potential is, how could I grow as an individual, as a Coach, as a Mum and as a friend? I believe you don’t really find out how brave, strong or capable you are until this is put to the test. We grow as individuals in times of adversity when the going gets tough we get tougher, we learn new things and we get stronger. The smaller things that scared us before no longer bother us because we have been through tougher times. I don’t think you should make your life hard intentionally that would be a bit silly – but I do think there is a lesson to be learned from all things we experience in life both good and bad. After all the bad can be good if you have learned something from it! I wrote a reverse bucket list of everything I had achieved in 2018. It was a great exercise of reflection and it inspired me to think further back to 5 years ago when I had trained for The Chester Marathon. I got up to 18 miles and developed tendonitis and was forced to drop out. I had a choice of carrying on and making it worse or resting so I could still do my job. Rest it was. 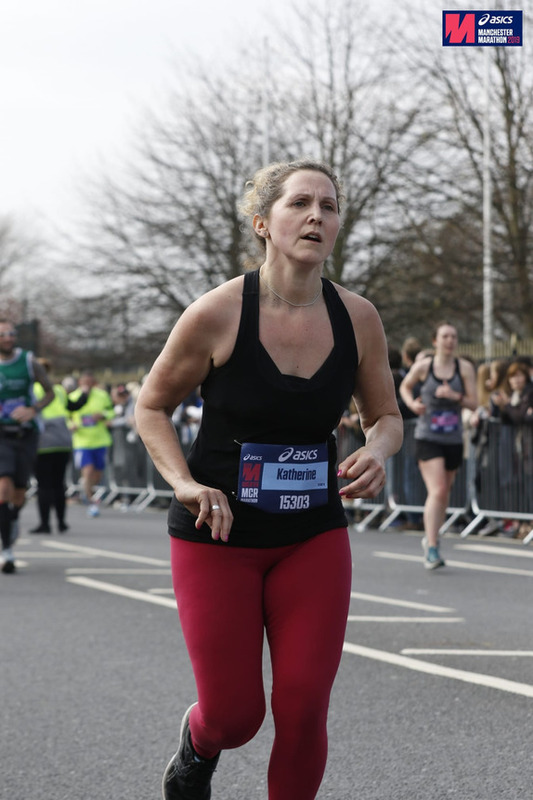 I kind of fell out with running after that – it put me right off! So there was unfinished business here. 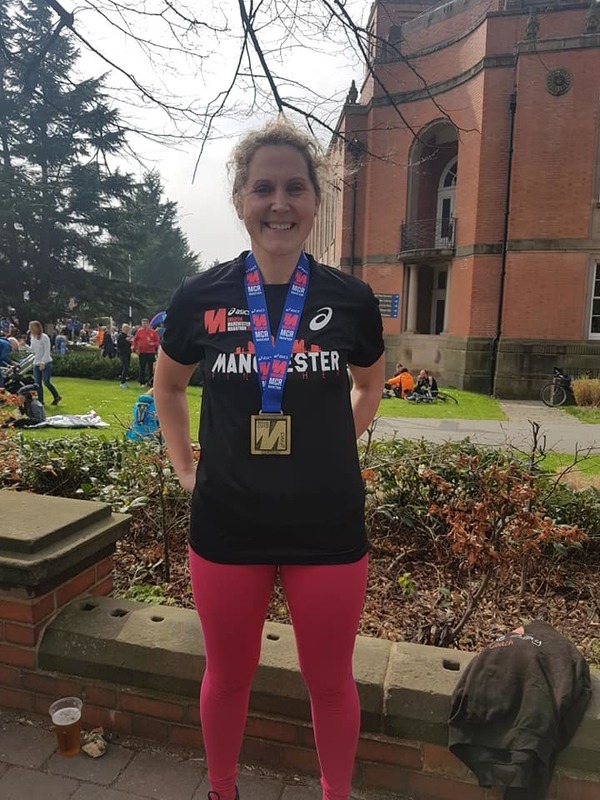 Before I could back out of the idea I found the first UK marathon I came across, The Manchester Marathon, I registered and paid right away – no turning back! Now this is the very first Marathon I have run so I decided that it would be a good decision to get some sponsors for it. It would motivate me to run even on the wet and windy days. Believe me there were several of these days training in winter; my 15 mile training run I remember well as it snowed heavily! I still went. That was thanks to the sponsors I received from my clients – it was now a job, I had to do it! The charity I chose was Ryedale Special Families, they provide all kinds of help and support for families in my local area who have children with all kinds of special needs. So far I have gathered £746 in sponsorship not including gift aid! I had started running a little in December as one of my clients had asked me to run with her. It had shocked me how hard I found it after spending the last 5 years bodybuilding! It hurt! Running just 3 miles then, although I could do it, it was hard work! But little by little this had got better and In January I started my training plan. 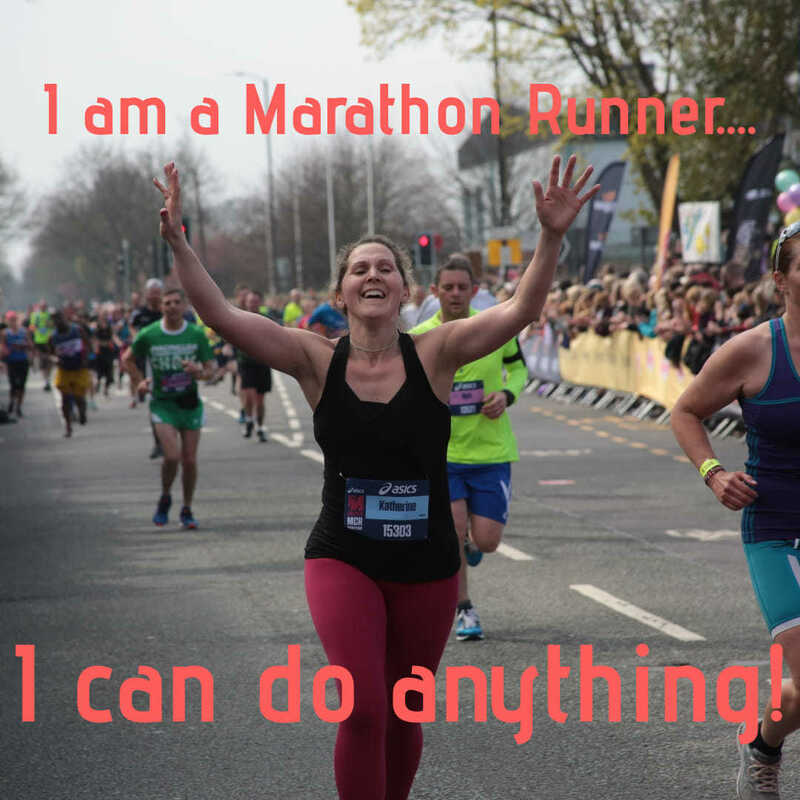 You run hundreds of miles before you actually run a marathon! January I ran a total of 100miles, February 120miles, I eased off in March 100miles a little as work started to get busier too! I woke up at 6am the morning of the marathon in a hotel room that I was sharing with my family, I didn’t need an alarm I was too excited I couldn’t wait to be a marathon finisher! Lots of people had asked me if I was worried about being able to do it, I wasn’t because I had trained but I also had the mindset to finish! I had decided so I knew I would, no matter what! Winners Never Quit! I really wanted to do this. I had a time in mind that I had trained towards; I wanted to get as close to 4hrs as I could. I knew it was a tall order and I had only run up to 20 miles twice as I had stuck to my training plan to avoid injuries. The last 6.2miles were an unknown for me but I knew I would get through it. I had a positive mind, I knew I would need it! We all need some help and accountability from time to time even me as a coach still needs one, I am the same as everyone else, I find things hard and we all try and talk ourselves out of things. 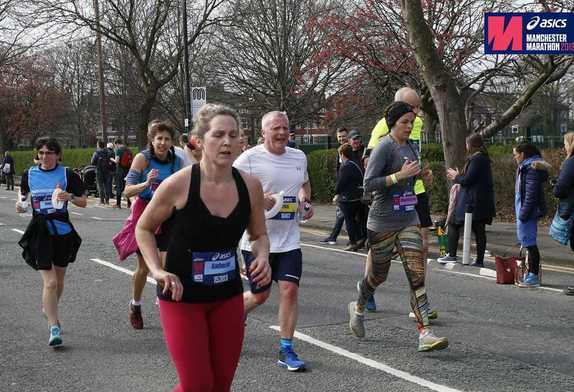 I was lucky to find Richard on a forum I joined on Facebook for the Manchester Marathon. The forum itself has been a godsend! 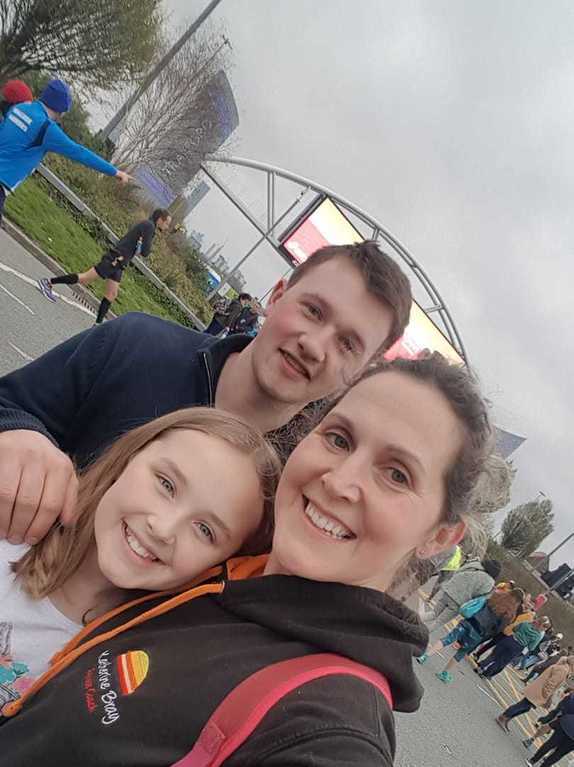 Lots of people sharing their training and supporting each other working towards a common goal of completing the marathon, they have all inspired and motivated me – especially Richard. He has been a great accountability partner for me, we shared our ups and downs of training, good runs and bad runs and on the days we didn’t feel like it we supported each other via whatsapp messages. 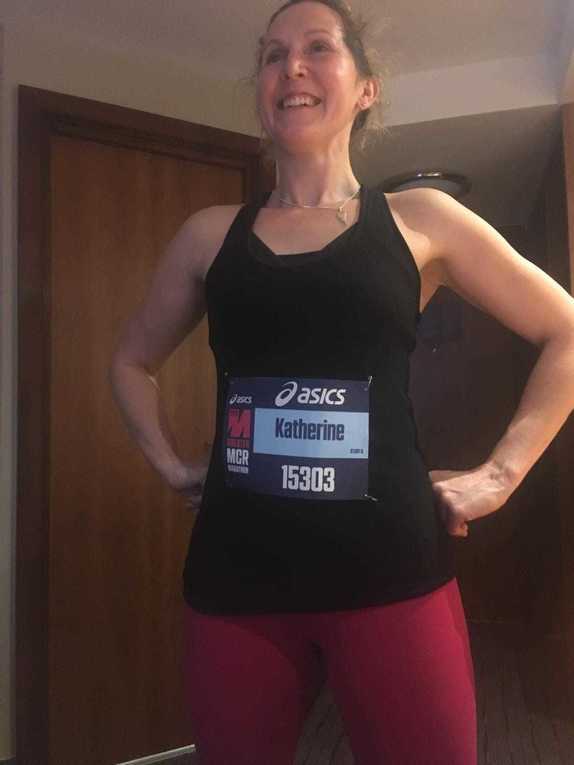 We had never met until the evening before the race so it was lovely to put a face to a message and settled my nerves for the morning with the logistics of getting there. Sounds a bit crazy but I was more worried about being late or getting lost and missing the race than I was about doing it! Me and the family met Richard after breakfast and travelled to the start via the Tram together along with everyone else! Oh no not a Porta-loo! When we arrived, we saw thousands of other runners! No need to worry though it was very well organised. We all went to our allotted pens and I waved goodbye to Richard as he was in a different pen to me (much faster than me!). We gathered and waited for the race to start, everyone eager to get going and lots of people having a last minute nervous wee! I had told myself I didn’t really need to go but just minutes from the start line I dashed into the nearest porta-loo and went; I really did need to go after all! I thought best to go before I crossed the start line and activate my chip timer! I set off a little too quick, I knew I would I couldn’t help it. I am used to running alone or with my little dog Pete, and with all these people around me I didn’t feel comfortable with so many so close to me, so I worked my way up the field. I wanted a 4hr marathon time and I was running with people aiming for 5hrs so I kept over taking people until I found a comfortable bit of spacing. I passed the 4hr 30 pacer and settled down. I had several humbling moments but a stand out one to me was a guy running in a Bliss charity vest, it said hand written, “This is for you Son”, that really resonated with me as I have children myself and I cannot imagine the pain of losing them. I spoke to him and we chatted for a little while. He told me how he had a 2 year old, he said it happened last year and he said he still hadn’t got over it. I don’t imagine you ever would just learn to live with it I guess. I felt in awe of his determination to do something positive and run the marathon for charity. What struck me most at this point was the variety of different people running for different causes; all ages, shapes and sizes and abilities. So inspiring to be amongst so many people all wanting to do a marathon for their own different reasons. All these people were drawing on their own inner strength to complete a marathon so I felt even more compelled to do the same thing. 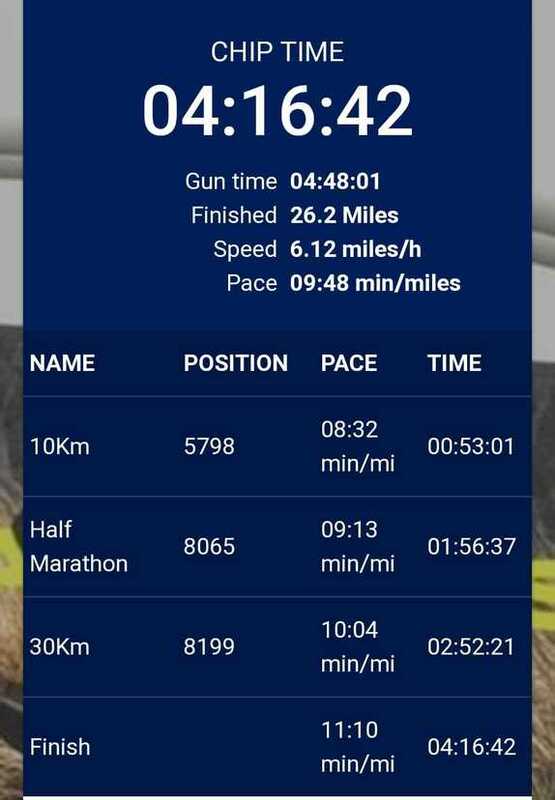 I got to half marathon distance and checked my time, even with a number 2 stop(sorry too much information but I feel the need to keep it real). I was running faster than my planned pace of a 9 mins a mile; I was 30 seconds a mile faster than I should be. I was a little worried I would run out of steam so I thought I would look for someone to chat to so I would slow down a bit. I found a man from Lincoln. Sounds random but I am actually from Lincolnshire originally. He was very friendly and he told me he was running another marathon next week (yes I thought he was mad too!). Anyway we chatted away and he told me how he was a postman and his wife was doing the London Marathon this year, he would be supporting her rather than running. For some reason I then decided to run on passed him and ran the next few miles in my own head space. I love running for this reason because you can just float off to your own world. The sun had come out and the temperature rose to around 16*C not that warm but when you’ve done most your runs in winter temperature it feels really hot. I had been drinking plenty of water at the water stations however the combination of the heat and the quicker pace at the start, I was starting to fatigue at 17 miles. My strategy was to use the water stations that were around 100m long to walk and run between each water station. It worked until mile 20 & 21 and I started to walk a little more. Other runners around me were feeling it too. I could hear them giving into the pain, cramp was kicking in for some, I was ok my feet were hurting a little but I just told myself that my feet were doing a good job and kept repeating to myself I can do this, I will do this and I must do this over and over again! Mile 22 and it felt tough again, it was here my postman friend caught me up! And what a saviour he said come on run with me! Wow it was just what I needed, I felt good to have a mate at this point, everyone needs a bit of help, support and encouragement. We don’t have to do everything alone! We ran together for a bit but I was slowing down a bit and when I slowed down for water at the next water station he kept his pace, and I kept the pace I was comfortable at. Just before the 25 mile marker someone from the crowd shouted, “Come on you’re less than 20minutes from the end!” That felt good to hear. I rallied and I picked my pace up. As I approached the last 1200 meters a marshal had a flag and was waving it and shouting, “You will see the finish line around the corner! 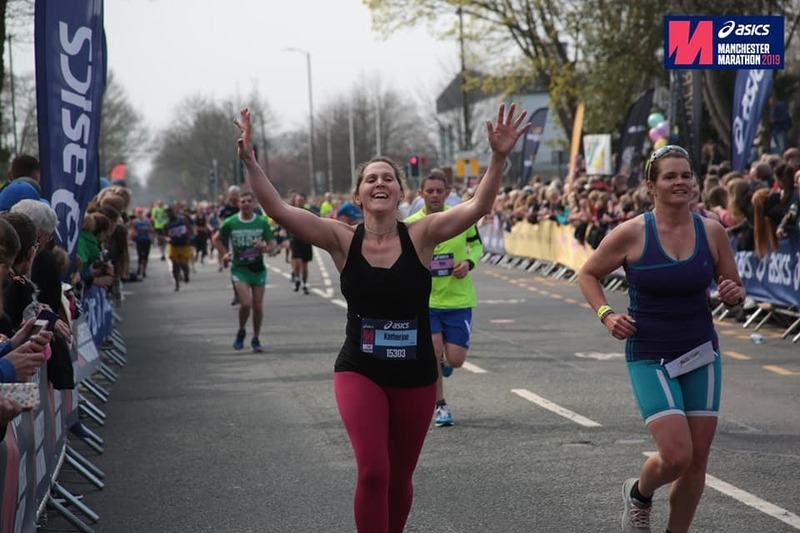 You can have a beer and there are toilets – you can have a poo!” She has obviously done a marathon! The crowd were amazing, they had been all the way round but down that last 800m it was something else! Everyone was cheering it was really loud but I felt like I was running down an echoey tunnel. I picked up the speed again after 26 miles, I felt like death and I wanted it to be over but I also felt the enormity of what I had accomplished! 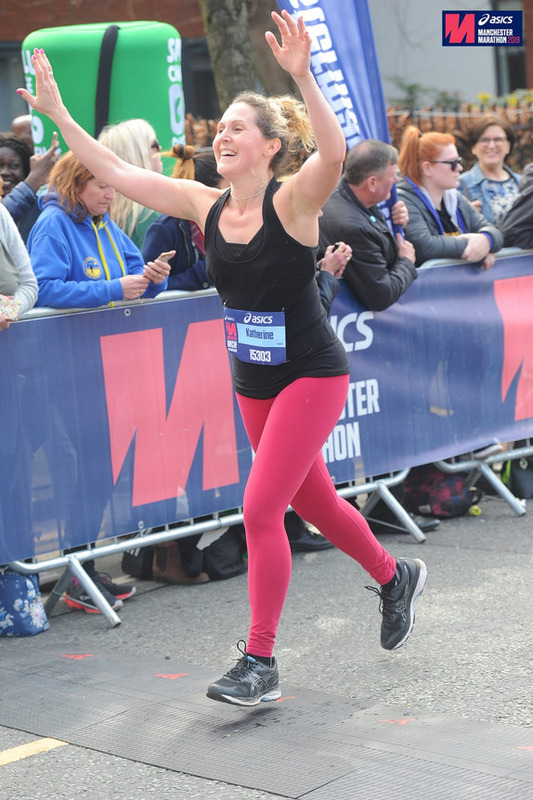 I was so emotional as I shot my arms up into the air as I crossed the finish line! I got a text message immediately telling me my time was 4hrs 16mins and 42 secs! I was so overcome with emotion and someone said, ”You’ve done it! Are you ok?” I just burst into tears and threw my arms round a complete stranger! United in our achievement he said, “what an achievement!” He was right. All that effort for a T-shirt and Medal! I picked up my medal and T-shirt and fought my way through the crowd I felt exhausted as I looked for my daughter, Jane and my boyfriend ,Neil. I found them, Jane ran into my arms and I burst into tears then Jane burst into tears, “Mummy I am so proud of you!” I said “Jane, you have no idea how hard that was!” I had no idea until I did it how challenging it was going to be! I knew it would be but wow that was really something! It’s only 3 days after the marathon, I returned to work yesterday but full use of my legs has only just resumed today! I am still in a daze about it all. I think it will take a while to let it sink in. What an experience a real achievement?! I have never done anything so physically and mentally demanding. “If you want to run, run a mile. If you want to experience a different life, Run a marathon.” Emil Zatoper. I know what he means and I often talk to my clients about getting out of your comfort zone. The thing is if you don’t challenge yourself to try something new how do you know if you can do it? IF you want experience life you have to do it, try the things that scare you as these are things that make us grow. I had no doubt you would do it,and what a brilliant time! !So good to read your journey from start to finish,- thanks for sharing.